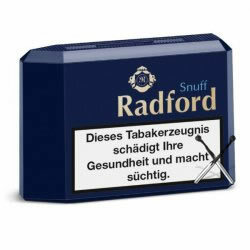 IMPORT - Poschl Radford Premium Snuff 10g dispenser. Exceptionally premium snuff , for those who settle for nothing but the best. Twice-fermented tobacco leaves and a particularly gentle grinding process combined with select spices and aromatic substances to create a new dimension in the enjoyment of snuff.